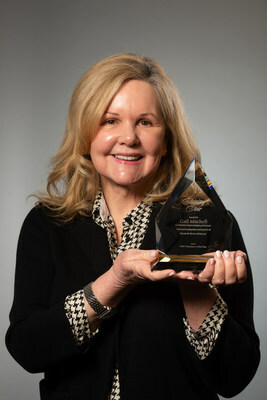 CARMEL, Ind., March 21, 2019 /PRNewswire/ -- CNO Financial Group, a holding company for several national life and health insurance companies that serve middle-income Americans and retirees, announced Gail Mitchell, vice president of underwriting, as the recipient of CNO's Invested in Giving Back Volunteer of the Year Award. A pillar of CNO's Invested in Giving Back charity program, the Volunteer of the Year Award recognizes a CNO employee for their commitment to community volunteerism. In addition, the company recognizes a charity of the recipient's choice with a CNO donation of $10,000. Mitchell serves as the Vice Chair of the CICOA Aging & In-Home Solutions Foundation of Trustees and has chaired the organization's only public fundraising event, Signature Breakfast. Mitchell also serves as a member of the organization's philanthropic task force, raising funds for unmet needs and planning future capital campaigns. "Gail's business knowledge and experience with non-profit organizations has proven invaluable in directing the activities of the foundation board and the committees she serves on," says Orion Bell, president and CEO of CICOA. "Her commitment to our organization is clearly demonstrated in the passion, expertise and personal contributions she makes to help our organization empower older adults and people of any age with disabilities." Mitchell is also an avid volunteer in Bankers Life Forget Me Not Days®, the company's signature fundraiser to benefit the Alzheimer's Association®, which has helped raise more than $5 million for care, education and research programs since 2003. "Giving back to the communities in which our associates live and work is a core component of our company's culture," said Yvonne Franzese, chief human resources officer. "We are proud to recognize Gail's commitment to her community and will continue to support our employees in their volunteer efforts." Since 2010, CNO has awarded $180,000 to organizations where our associates volunteer their time and talent, recognizing more than 30 unique associate volunteers. CNO Financial Group, Inc. (NYSE: CNO) is a holding company. Our insurance companies – principally Bankers Life and Casualty Company, Colonial Penn Life Insurance Company and Washington National Insurance Company – primarily serve middle-income pre-retiree and retired Americans by helping them protect against financial adversity and provide for a more secure retirement. For more information, visit CNO online at CNOinc.com.